With Super Bowl only a few days away, I thought you might like a little craft to do with the kids! This paper craft is super easy and only needs a few supplies. Super Bowl - Go Pats! paper - any kind is fine! Have students, draw a football on a piece of construction paper or any kind of paper (even a brown paper bag!) Basicly draw an oval type shape. This is the body. For younger students, make a template that they can trace. Also draw 4 small footballs to be the hands and feet. 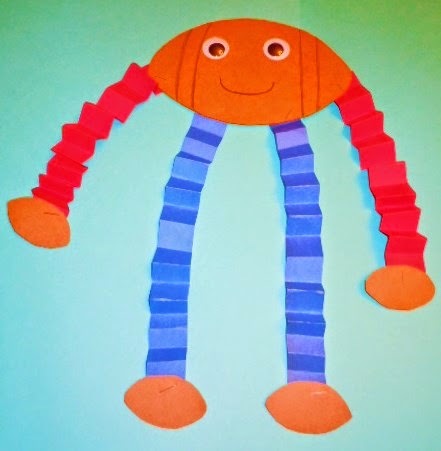 Cut 4 thin strips of paper for the arms and legs. Then fold the strips back and forth accordion style. Staple or glue the arms and legs to the body. Then staple or glue the hands and feet. 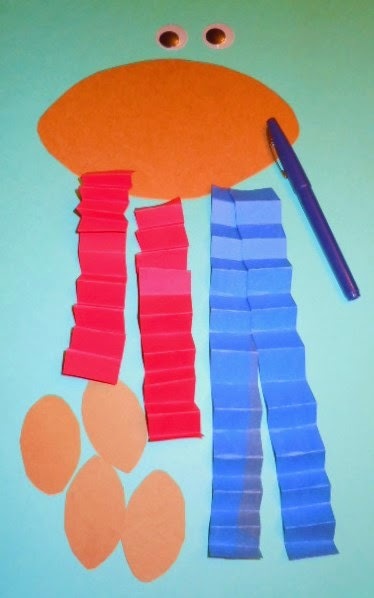 You can also make this craft any time of year and choose your students' favorite team colors! I also have a fun football Odd and Even Coloring page for your kids! Just click on the link below. Check out my Pinterest Board - "February" for other craft and educational ideas for Football Season, Valentine's Day, Groundhog Day, etc. Just click the link below. In New England, we are so very, very, very excited because our favorite football team, the New England Patriots, will be there playing along with the Seattle Seahawks!!! So in honor of both teams being in the Super Bowl, I have for your students 2 fun Odd and Even Football Printables. Each worksheet has lots of footballs with odd and even numbers. Students will color in the footballs on the first worksheet with red and blue crayons in honor of the Patriots and blue and green crayons on the second worksheet in honor of the Seahawks. These free printable worksheets can be downloaded directly from my website. Just click on the link below. If you are working on number sequence to 120 with your young students, it's good to have a variety of resources with different themes to keep the kids engaged and interested. Last month, I posted a free Winter 120 Number Chart . You can see that post here. Today, I want to give you a Valentine's Day 120 Number Chart for students to fill in and then color. You can download this free chart at my website. Just click on the link below. I finally did it! Yes, I finally had my blog redesigned! I can't believe that I waited so long! I had been thinking about doing this for awhile but wasn't sure what I wanted for a design choice or who I should hire to do it. I choose Oxana from Oxana's Blog Designs. I first met Oxana about 2 years ago when I was looking for some science clip art to use in my Solar System Word Wall Cards Set that I was making. I was amazed at how wonderful her clip art was. At the time, I was finding lots of cutesy clip art but having LOTS of trouble locating GREAT science clip art. Oxana had both types in her TPT store! I was beyond thrilled! It was only a couple of weeks ago, that I found out that Oxana also does Blog Designs and Blog Re-designs. I was thrilled! Oxana is wonderful person to work with. Besides doing Custom Blogs, she also makes custom clip art. In the past, she has made some wonderful custom clip art sets for me to use in my other science products. If you want to check out Oxana's website to see her custom designs, click the link below. If you want to check out Oxana's store at TPT with lots of great clip art, click the link below.